The soft and bittersweet consonance of post-rock, the droning of depressive doom metal, and progressively-minded arrangements are three elements that shouldn't sonically "play nice" on paper. 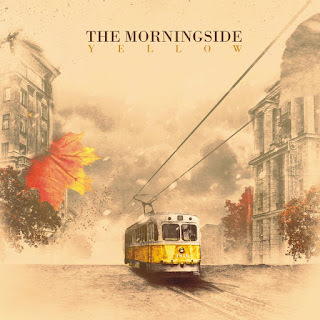 Moscow's own The Morningside shows with their latest album, Yellow, that not only can the aforementioned elements co-exist in the same thought but that they also can be separate components that make a much greater whole, one that is truly unique. The album's opening track, "To The Last Point...", was actually the first thing I had ever heard from The Morningside on a trailer for Yellow and to be honest, I thought I had mistakenly stumbled upon another band that also happened to be named The Morningside. With reverberating synthesizers transitioning into Explosions in the Sky-esque post-rock, one could understand my confusion for hoping to hear something from a band that's described as "melancholic doom metal". But with the passing minutes, my confusion quickly shifted into joy as I realized that these more sedating sections are merely one piece to the puzzle that The Morningside assembles over the course of Yellow. The genre-blending diversity of this album is easily its greatest strength. Tracks on the album such as "As a Pilgrim" and "Out of Nest" demonstrate how effortlessly The Morningside balances serene acoustic guitar with powerful leads and resounding power chords. The back-half of Yellow also showcases the use of melotrons and other quirky soundscapes more commonly found in classic progressive rock. Like the musical arrangements, vocals are also no exception to boasting a dynamic range. Easier-going tracks feature more intimate, clean vocals, like "Missing Day" or "Clocks", while the album's heavier-hitters stand out with screams that could easily fit into any Enslaved material. Yellow may not be an album that redefines any genre boundaries, but it certainly is entertaining to listen to a band incorporate so many nuanced styles so well. From the power of its doom metal aspects, to the serenity of its melancholy, to its small progressive intricacies, The Morningside has delivered an album that can appease fans of various genres. If you've been seeking something that's easy to listen to but also has some great heavy moments and other surprises along the way, Yellow is where your search ends.